American companies dominated amateur radio during the "golden years" of the 40's, 50's, and 60's. Today, nearly all of these companies-- Collins, Hallicrafters, Hammarlund, R.M.E., National, E.F. Johnson, Millen, Gonset, Morrow, Swan, and others -- are out of business or focused on other product areas. The value of vintage radios has soared in recent years, and "collector quality" radios frequently command prices far exceeding their initial cost. 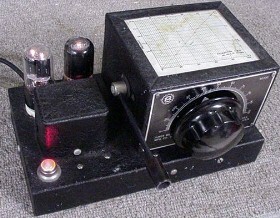 This Millen model 90700 "Variarm" 2 Watt transmitter was based on an article by Henry Rice in January, 1941 QST magazine. 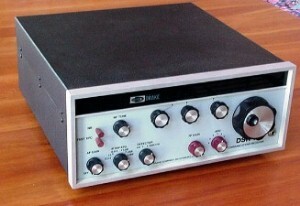 Using the calibration chart on the top cover, the user set the frequency with the large knob. The long "variarm" tuning wand was used for fine frequency adjustments. Because vacuum tubes have an extremely long shelf life, vintage rigs are still usable. Nets and get-togethers are common on the ham bands, as collectors meet via radio to share expertise, buy, sell and swap their collections, and enjoy their shared interests. CLICK ONE OF THE FOLLOWING CATEGORIES TO SEE MORE!